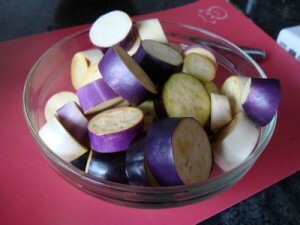 This week’s slow food market yielded a lovely little collection of eggplants. A handful of different varieties and colours that I simply could not walk past. Nor could I wait to eat them. They were required market evening eating. 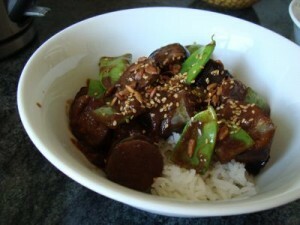 I had been eyeing off a recipe for eggplant and red miso for some time. It was a recipe whose time had come. Blanched snow peas folded through, sesame seeds on top and some steamed rice to serve made a hearty but light meal packed with flavour. One to be repeated. Dani cooks. A lot. She loves to create real food. No processed muck. Simple and complex, budget conscious and extravagant. Her best friends in the kitchen are her thermomix and her slow cooker.She is also a mum. A wife. An educator. Life is busy. Life is good. Mmmm, that looks perfect for this weather! I think I’ve eaten something similar at a Japanese restaurant – it was our favourite dish of that night. Very well suited to this weather Cindy. Especially as it is so quick to cook.